A mural painted on the walls of Casa Tochan in Mexico City with the flags of Central America, where many of the migrants hosted in the shelter arrive from. Casa Tochan is part of a Mexico City network of migrant shelters that includes MCC partner Casa de los Amigos. 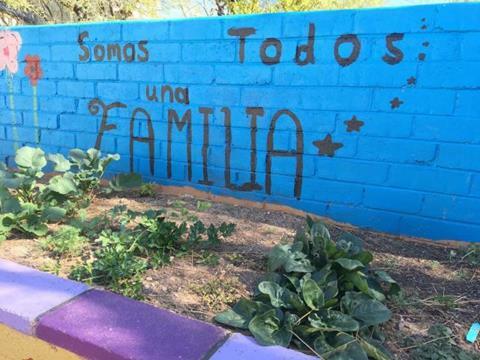 MCC advocacy staff visited Casa Tochan in August 2017 as part of a learning tour around migration and advocacy. A caravan of about 7,000 Central American migrants entered Mexico in mid-October. Though this caravan is unusually large, traveling together is common as migrants are less likely to be victims of violence in a bigger group. Most are fleeing violence and poverty in their home communities. As with previous caravans, many people are likely to seek asylum or work in Mexico. People have the right to seek asylum in a country where they feel safe, including the United States or Mexico. The caravan is currently in southern Mexico but now numbers about half of its original size. In response, President Trump is deploying 5,200 military troops to the U.S.-Mexico border (which could increase to 15,000) and is threatening to build tent cities to hold asylum seekers (including families) indefinitely, restrict access to asylum (in violation of U.S. law) and suspend aid to Central American countries. The military action, tent cities and a request for additional border walls all come with significant financial costs—which is why advocacy on Fiscal Year 2019 federal spending bills is so important. Immigration: On October 3, a federal judge temporarily blocked the Trump administration from ending Temporary Protected Status (TPS) for about 300,000 people from El Salvador, Haiti, Nicaragua and Sudan. On October 10, the Department of Homeland Security waived 28 laws to speed construction of border walls in Texas. The administration is reportedly considering a new policy to separate or detain families seeking asylum. Read about these issues and more in the October immigration update. President Trump also indicated last week he might issue an executive order to overturn the right of birthright citizenship, but legal scholars argue that removing a protection enshrined in the U.S. Constitution will not be so easy. Photo: NASA satellite imagery shows the “methane bubble” over New Mexico and Colorado (in red). Photo courtesy of NASA/JPL-Caltech/University of Michigan. January 25, 2019 is the deadline for submitting essays for our annual MCC U.S. Washington Office essay contest. Essays should be submitted to your nearest MCC regional office. April 5-8: Registration is now open for the Ecumenical Advocacy Days 2019 national gathering in Washington, D.C. The Global South Voices delegation came to Washington, D.C., on October 3-4. MCC staff and partners from Zimbabwe, Nepal and El Salvador spoke in congressional offices about the impacts of climate change on their communities. On October 7, Tammy Alexander spoke about the theology of migration for a joint adult education class with University Park Church of the Brethren and Hyattsville (Md.) Mennonite Church. On October 8-9, we welcomed our Volunteer Advocacy Coordinators Network for meetings, including with their elected officials. Network members are from California, Idaho, Indiana, Kansas, Ohio, Pennsylvania and Virginia. Whitney Ricker completed her term as Climate Advocacy Intern in October. The annual internship is a joint program between MCC and the Center for Sustainable Climate Solutions. We are grateful for Whitney’s work and wish her all the best. Charissa Zehr shared with participants of the MCC UN Student Seminar about advocacy on DPRK (North Korea) in Washington. Photo: Participants of the Global South Voices tour visits congressional offices in Washington, DC. MCC photo. Photo: Our Volunteer Advocacy Coordinators Network. MCC photo/Cherelle M. Dessus.